SPECIAL LIMITED EDITION DIGIPAK For the grand finale of her best-selling Mozart Project, Anne-Sophie Mutter has joined with pianist Lambert Orkis for her first-ever recording of Mozart’s violin sonatas. Anne-Sophie Mutter’s Mozart Project has been nothing if not ambitious. Her aim: a survey of all Mozart’s major compositions for solo violin. The first two releases, the Violin Concertos and a selection of Piano Trios has both been commercial and critical successes around the world. The final segment, the Violin Sonatas, is being released as part of Deutsche Grammophon’s “Mozart Forever” celebrations. It will also mark an additional milestone: the 30th anniversary of Mutter’s concert debut. This live CD recording took place during Mutter’s performances in Munich in February 2006, which were also filmed for TV broadcast and DVD release. 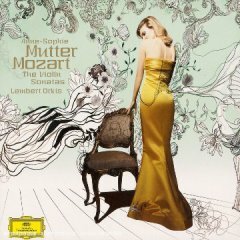 There are many excellent recordings of Mozart’s Violin Sonatas on disc to choose from, but Anne-Sophie Mutter’s interpretations rise quickly to the top. Her approach is certainly closer to “old fashioned” than “authentic instrument.” She sings the lines as if they were arias and uses vibrato liberally to emphasize the unwritten texts. Her use of dynamics can be extreme, from a soft murmur to a full-blooded cry. There is a sense of warmth and even rapture in some of the slow movements that is absent from most of the “authentic” recordings. Mutter’s vigorous approach to the allegros captures attention. Her great technique is most welcome in the formality of the menuettos. Lambert Orkis’s piano accompaniments are handsome and supportive throughout, and his work as a fortepianist pays off well. He has an ingratiating touch and really shines in K. 454 and K. 481, where the piano is given equal footing with the violin. There are almost four-and-a-half hours of music here, and all of it is beautifully performed.